Mini-Medical School to discuss flu prevention. 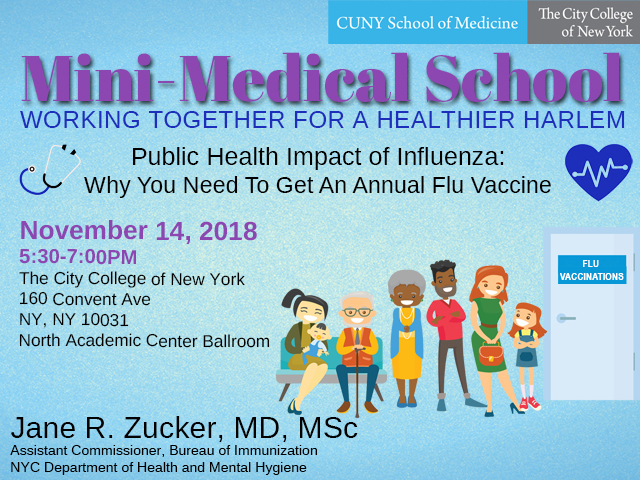 The CUNY School of Medicine (CSOM) will host its tenth Mini-Medical School on Wednesday, Nov. 14, to discuss how to stay healthy during the flu season. This session, entitled “"Public Health Impact of Influenza: Why You Need To Get an Annual Flu Vaccine" and presented by Dr. Jane R. Zucker, Assistant Commissioner of the Bureau of Immunization at the NYC Department of Health and Mental Hygiene, will explore the importance of getting an annual flu shot and other ways to prevent getting the flu. The talk, which is free and open to the public, will take place on Wednesday, Nov. 14, 5:30 p.m.-7:00 p.m., at the CCNY Campus North Academic Center (NAC) Ballroom. Click to RSVP. Mini-Medical School provides an opportunity to explore various health topics, empowering members of the Harlem community with the knowledge to actively take part in their healthcare. With no prior educational requirements, information is presented in an engaging, easy-to-understand style by health professionals and experts in related fields. Save the date for the next CSOM Mini-Medical School: "Opioids Everywhere: A Practical Guide to Understanding & Combatting the Current Crisis" on Dec. 12th. The presentation will be led by Howard Greller, MD, St. Barnabas Health Systems.